The 2016 presidential election is drastically different from previous races when it comes to courting young voters, primarily because of the many popular mobile apps out today that didn't exist four years ago. And millennials, the most frequent users of such apps, are a demographic that can't be ignored. According to a recent survey by Adecco Staffing, 71 percent of Gen Y and Gen Z students plan to vote in the upcoming presidential election. "Millennials are the mobile-first generation, getting news from mobile apps and expressing themselves with emojis and GIFs," said Scott Nelson, head of Viber North America. Indeed, per comScore, U.S. consumers ages 18 to 34 individually spend 368 minutes per month on mobile instant messaging apps, 20 percent more time than the 305 minutes the average mobile internet user spends. So we took a look at six apps that Hillary Clinton's and Donald Trump's campaigns could use in interesting ways in the coming weeks. Five of them are messaging apps. And for good measure, we threw in Pokemon Go since it has effective features for driving attendance to speeches, fundraisers and other campaign events. Among millennials who are likely to vote in the 2016 election, 34 percent use Snapchat, according to an online survey by Global Strategy Group and Public Opinion Strategies. What's more, 67 percent of Snapchat's millennial users are likely to vote in the election, compared with 61 percent of millennials overall. Snap ads: These videos have already been used by Republicans in U.S. Senate races and were utilized by Rand Paul's and Scott Walker's failed bids for the GOP nomination. They will surely be employed by Clinton and Trump in the coming weeks, but the campaigns haven't deployed Snap Ads yet in their head-to-head matchup. Sponsored geofilters: These ad units let brands offer Snapchat users cool, themed overlays to the images they share. They were widely used in the primaries, chiefly by Bernie Sanders, who bought Get Out the Vote geofilters in Iowa, New Hampshire, New York and other states. Republican Marco Rubio also used them in his bid to take down Trump. 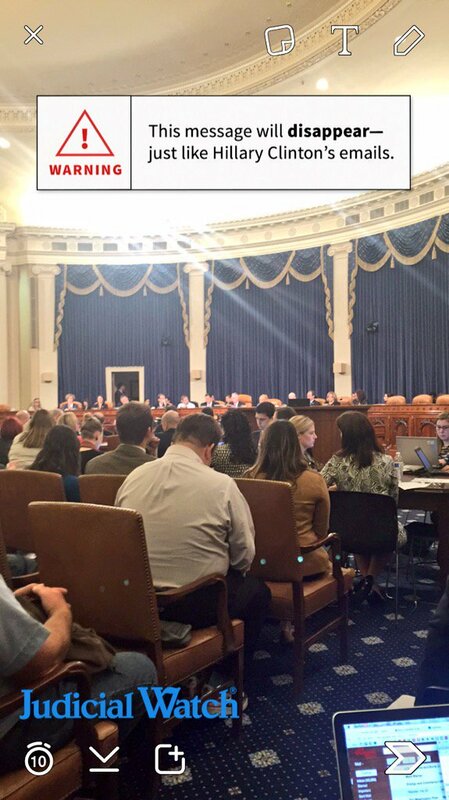 And, they were utilized by Clinton to tackle Trump (see above image), while pro-Trump marketers bought the geofilter seen on the right to mock Clinton during her hearing about her use of a private email server. Sponsored lenses: These are expensive, costing hundreds of thousands of dollars per day, and they've never been purchased by a U.S. politician. The lenses add colorful filters to selfies—from rainbow vomit to zombie faces—and are wildly popular with Snapchat users. It will be interesting to see if either camp forks over the big cash for a lens or two. Because they are national buys, look for them from the political right and left heading into Election Day in November. Though only a few weeks old, Pokemon Go reportedly has as many as 50 million users now. The app employs a smartphone's GPS to alert users when they're "in the game"—or when Pokemon characters appear on their phone in augmented reality. The concept entices players to move around their locale and earn points by catching the characters. "Pokemon Go is an opportunity for Hillary Clinton and Donald Trump to harness the power of mobile to reach voters," said marketing consultant David Deal. "But they need to understand the ethos of the game to succeed. No one wants to engage in politics when they're playing Pokemon Go. Players want to have fun. The presidential candidates need to tap into the joy of the game and understand how to reward players with incentives instead of throwing political dogma at them or using Pokemon Go to create negative ads that bash the other candidate." Sponsored locations: On July 20, the Niantic-owned game debuted its first sponsored location ads for McDonald's in Japan. The paid promotions transform areas into "gyms," which let players battle or train characters in the mobile game, making them enticing destinations for Pokemon Go players. Simply put, they should, in theory, drive significant foot traffic. This feature seems like an interesting way to draw young voters to stump speeches and other campaign events in the coming weeks. Lure modules: L'inizio Pizza Bar in Long Island City, N.Y., told the New York Post that its sales jumped 75 percent in one weekend when it activated this feature. The lure modules encourage patronage because they place virtual Pokemon characters—via the app's augmented-reality capabilities—in a location. You can buy a dozen of the characters for as little as $10, per the Post article. So once again, Pokemon Go seems like a no-brainer for drawing crowds to campaign events. Deal had a couple of suggestions for the campaigns. He said they should "use lures to attract players to locations where candidates are hosting events. Be ready to register voters without getting into heavy political discussions with them." Secondly, Deal said, they should provide "a utility to Pokemon Go players. "Players are always running out of battery charges on their mobile phones, for instance," he said. "The candidates could set up free charging stations and provide campaign tchotchkes and voter registration at the stations." There are 1 billion monthly Messenger users with millions upon millions in the U.S. If the GOP or the Democrats can find a way to use this app, they undoubtedly will. Chatbots: These are still in beta and require a fairly rigorous approval process on the part of Facebook. But the social giant is accepting proposals, and it would be a boon to either party to get a bot going. 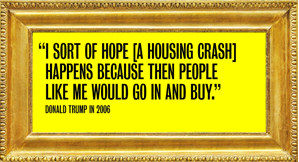 The first step for Trump or Clinton would be to find a developer who's had success working on Facebook. Dave Cotter is the CEO of ReplyYes, a startup that sells vinyl records and has achieved great, early success with bots. Cotter believes the campaigns need to be clever but transparent if they attempt to make a bot game. "Create a bot game where it gets out the vote," Cotter suggested, "[where] you type in where you live, and it tells you people in your area who need to vote." In addition, Cotter said, "Users could ask the bot about guns, gay marriage or Saudi Arabia and receive answers about where the candidate stands on topics." Kik points: This is a rewards program that lets users earn points by completing activities on Kik such as watching videos or downloading sticker packs. Users can redeem points for digital goods like smileys. The candidates could create campaigns where users watch videos of ads in return for Kik points. Smileys: This feature is a combination of a sticker and an emoji, and Trump or Clinton could quite easily create custom versions to share with Kik users. Hey, it's all about the buzz. Branded GIFs: In another custom opportunity, the candidates can create branded, shareable GIFs. Kik charges brands based on the audience reach, though marketers do not need an official account to utilize it. Bots: Kik lets marketers run bots that interact with users, providing predefined chat messages triggered by keywords. A Trump or Clinton bot could be informational like The Weather Channel's bot, or it could be designed for a fun kind of engagement. 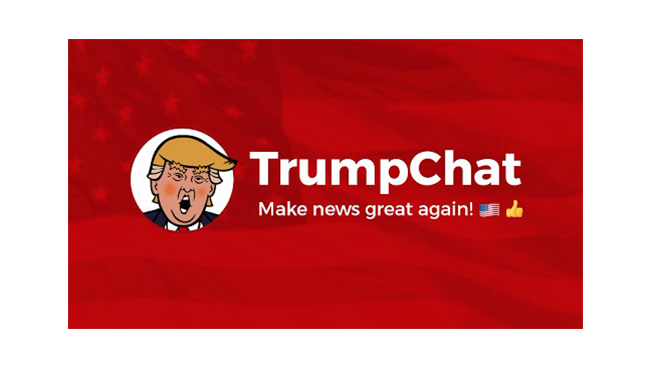 The online publication Mic created a Trump parody bot on Kik called Trumpchat. This app boasts 754 million users worldwide, and the U.S. is its top market. It recently inked an election-minded deal with The Huffington Post for news distribution, and the online publication's chat channel on Viber quickly accrued 14,000 followers. The app calls itself a mix of Snapchat, Facebook Messenger and other apps, but it seems to most resemble Line. What can Trump and Clinton use? Promotional stickers: There are free and paid sticker packs, but the candidates will most likely use the gratis version—such as the ones Viber mocked up below—since they're designed to drive awareness. The paid version is for driving revenue. Public chats: This is the format HuffPost is employing, allowing marketers to communicate directly with Viber users while building an audience on the platform. Service messages: Via an applications programming interface, or API, marketers can target messages at users. The marketer pays a fixed rate per country. Nelson of Viber said, "Both Hillary and Donald would benefit from something like our public chats feature, specifically because it gives them a more direct way to reach voters on a platform where they already spend their time." This Japan-based messaging app had an impressive IPO recently, and it claimed to have as many as 25 million U.S. users last year. (It has 218 million global monthly users.) The millennial-focused mobile platform has tens of thousands of playful, often cartoonlike images—called stickers—that are concocted by a vast network of artists and sold under revenue-sharing agreements with the creators. Consumers typically spend a couple of bucks for a pack of the digital depictions. Official accounts: Any brand can set up its own account, similar to a Facebook or Twitter page. In December, Amazon used Line for a holiday campaign that asked users to choose between two ugly sweaters. After picking their favorite, users could then click to buy the sweater. Trump and Clinton could do likewise with their campaign merchandise, and the accounts are free. Stickers: These are giant emojis that Line offers for texting, and they've been key to the app's popularity. They are easily shareable among Line users, and a packet of stickers only costs a few bucks. With great creative, they could be the digital versions of famous campaign buttons such as "I Like Ike." The stickers could be sold to supplement donations or be given away for free. 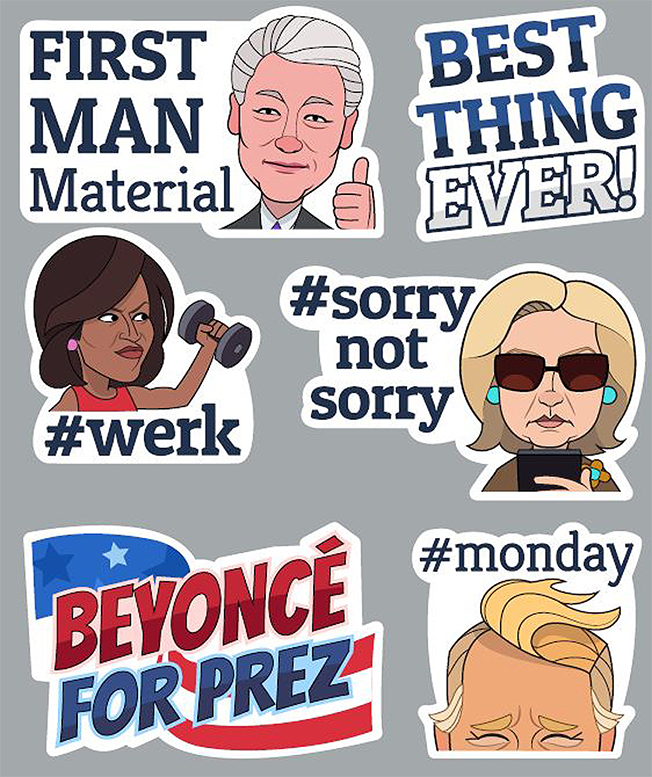 "Line stickers should be part of Hillary Clinton's and Donald Trump's visual vocabulary to connect with millennials, but only if the candidates do their homework and understand the nuances of Line," Deal, the consultant, said. "I would suggest they work with the app to give away the stickers."